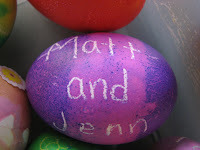 HAPPY EASTER, EVERYONE! We really wish we could be home to celebrate with everyone, but as you can see we did have a nice Easter morning! 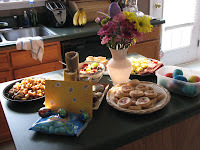 I made a little breakfast buffet - I guess I've been so used to the ones in Myrtle Beach that Easter doesn't feel like Easter without one! We hope you're all having a great day, and we can't wait to visit with you again!